Nikon today announced a trio of compact cameras with 1” sensors, all under the DL name. In doing so, Nikon is playing catch up with Canon (1” GX models) and Sony (1” RX models) simultaneously it appears, though Nikon has managed to do one interesting thing we haven’t seen before. 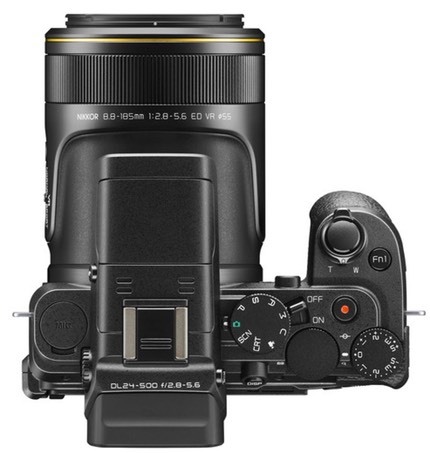 All models include EXPEED6a, 4K UHD video at 30 fps, a hybrid CD/PD autofocus system similar to the Nikon 1, the new Bluetooth-enabled SnapBridge debuted on the D500, nano and fluorine coatings on the lenses, up to 60 fps still capture (with first focus, 20 fps with continuous focus, again ala the Nikon 1), built-in ND filters, exposure compensation dials, and a rear tilting touchscreen LCD. Regular Speedlight capability is also available via the multi-purpose hot shoe on all models. The bad news on all these models is that Nikon has gone to a USB charger. These are cameras that will almost certainly chew through batteries—especially if you opt for the optional EVF on the two lower models—so be prepared to buy a dedicated charger and extra batteries if you intend to make any of these your workhorse travel camera. Let’s deal with the first model first, since it is the least surprising and probably the most desirable to this site’s readers. It also has impacts on the Nikon 1 line. The target here is clearly the Sony RX100 and perhaps the recent Canon G7X and G9X. Nikon’s version is a bit bigger than the Sony, but offers a bit more reach at the telephoto end (85mm instead of 70mm). This model also has a built-in flash. On the flip side, while less expensive, the Nikon DL 24-85 doesn’t have a built in EVF. So by the time you add the optional EVF you’re close to the RX’s price point. One nice point, the 24-85mm has a special macro mode to its lens. But you also have to think Nikon J5. For the first time in a long time we have the market flipped upside down, with an ILC costing less than the equivalent fixed lens camera, and the ILC more poorly configured (the J5 can’t take an optional EVF, for example, and has a slower kit lens). Do you want to give up the 1.5-2 stops of light and save some money by buying the J5, or would you like the better portability the collapsing lens provides on the higher priced DL? 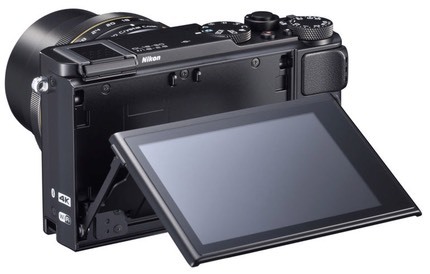 Even more interesting is when you compare these new DLs against the Nikon V3. Hmm, DL and V3 are both optional EVF. The V3 doesn't have anything close to the equivalent DL lenses available. 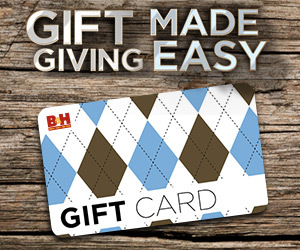 The V3 is more expensive (oops, we did it again). This is the typical dilemma Nikon keeps putting themselves in: how do you market the full line of Nikon products and make sure that customers know which one is right for them and buy into the brand appropriately? Nikon has made misses on price, on message, on features, on performance, on a whole host of things, all of which makes it more difficult for their marketing and sales arm to make sense of products to their customer base. So I’m very curious to see how Nikon thinks you sell the DL 24-85 versus the Nikon 1, and even versus the low end DX DSLRs. That said, the second camera in the bunch has raised a lot of eyebrows, including mine. Here we have something that we haven’t really had before: a very wide angle to normal zoom that’s fast on a larger sensor. Certainly we’ve never had this before in a camera that can fit in a large pocket. Such a camera solves a lot of problems for me when I’m shooting sports or wildlife, as I’ve already got two large cameras with big telephoto lenses hanging from my neck most of the time: I need something highly portable and probably pocketable to cover the rest of the range, and the DL 18-50 looks like a very interesting possibility. But the eye-catcher in Nikon’s details is the so-called Perspective Control. I’m guessing that the linear distortion of the lens is high, and if you want straight lines you’re going to get lots of pixel shifting. That’s something that needs to be tested in practice to be understood. The optional-ness of the EVF seems out of place, too. The trend in cameras, even compact ones, has clearly been towards built-in EVFs and away from optional ones, yet here we are with Nikon still bucking the trend. Having an EVF protrusion is contradictory to the portable-ness of these cameras, provides a significant failure point, adds cost, and eats up space on the camera we want for flash. And on the DL 18-50 the optional EVF sits at the left edge of the camera. Meanwhile, the Coolpix P600/900 models just got a sensor bump with the DL 24-500. While not nearly the reach of the P900 (nothing really is), this is still a camera that sits squarely in that “do everything” pocket Nikon keeps targeting. Only that’s not your jacket “pocket" they’re targeting ;~). Long reach lenses require real hand grips and some mass or else you have no chance of getting them steady, even with VR involved in the process. 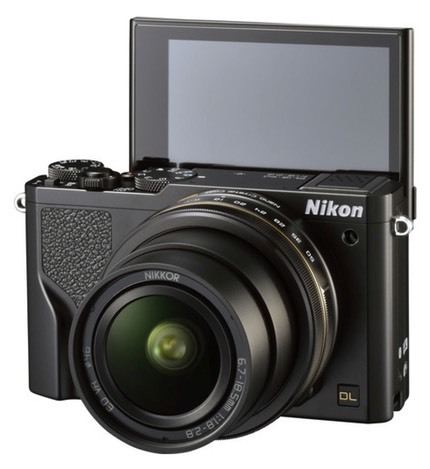 Thus, it doesn’t surprise me that Nikon went with the significantly larger P-style bridge camera design for this model. The larger body style DL 24-500 also seems to have brought out some additional points that should appeal: we’ve got a control wheel and even an AE-L/AF-L button (though it’s too small and not quite in the right place). The DL 24-85 doesn’t dislodge the RX-100 out of my pocket. I don’t see enough gain while I see some losses (size and built-in EVF). One thing that could turn the tide is if the DL’s lens performs better to the edges than the RX’s. Right now, the RX doesn’t perform like a 20mp camera, and a lot of that is due to the lens. Likewise, autofocus performance might change my mind, too. The DL24-500mm doesn’t really fit my shooting needs, but I can see some wanting this all-in-one approach. Personally, I’m a little gun shy with the long powered zoom approaches: by the time I’ve zoomed to where I want to be, the opportunity is gone. Beyond that, f/5.6 is a bit slow for the 1” sensors, IMO. When I’m shooting wildlife—one reason why I’d want 500mm—at f/5.6 I often find that I’m at ISO 800 or above to keep shutter speeds up. So, sure, if your subject is out in Sunny 16 you might find the output from the 1” sensors you can get is fine, but start moving into the shade or edge of day and you start having problems. Nikon’s pricing, for once, isn’t outrageous, but it’s also not exactly bargain priced. Still, respectable pricing is a bit of a surprise. One more thought: Nikon seems to be wandering around trying to find the “right addition” to the long-established DSLR lineup and replacement for the floundering Coolpix one. Consider: Nikon 1, Coolpix A, DL, KeyMission. Is there a “center” there? Or is this just a set of random parries to find something that sticks? What every enthusiast and pro wants is a highly competent camera that’s small and rugged and that they can carry with them all the time. But that requires essentially that you give us as close to a DSLR as you can in that smaller size. Canon G7X — 24-100mm f/1.8-2.8 lens, US$600, but no EVF option. Slightly smaller than the Nikon DL 24-85mm. Canon G5X — 24-100mm f/1.8-2.8 lens, US$750 with built in EVF. Bigger and more awkward than the two smaller DLs, though. Canon G3X — 24-600mm f/2.8-5.6 lens, US$900, optional EVF. Smaller and more traditional rangefinder design than Nikon’s DL 24-500mm. Canon G9X — 24-85mm f/2-4.9 lens, US$450, but no EVF option. Smaller than the Nikon DL 24-85mm. Panasonic ZS100 — 25-250mm f/2.8-5.9, US$700, built-in EVF. Small like the DL 24-85mm. Panasonic FZ1000/Leica V-Lux Type 114 — 25-400mm f/2.8-4 lens, US$800, with built-in EVF. Smallish DSLR type design. Sony RX100IV — 24-70mm f/1.8-2.8, US$950, with built-in EVF. Shirt pocketable. Sony RX10II — 24-200mm f/2.8, US$1300, with built-in EVF. Smallish DSLR type design. And let’s not forget that you can get the older RX-100’s still as new from places like B&H [disclosure: this site’s exclusive advertiser], the m4/3 like Panasonic LX-100 (and Leica equivalent), and if you’re really feeling like something more flexible, the Olympus Pen-F and Panasonic GX-8 with larger 20mp m4/3 sensors, m4/3 lens mount, and built-in EVFs. In other words, Nikon is running into a log jam here. So the question is this: what have they done that’s different enough, better, or significantly changed, that would attract you over all those other cameras I just mentioned? Right. I’m back to the DL 18-50mm f/1.8-2.8, which is unique. For the others, the jury is still out.